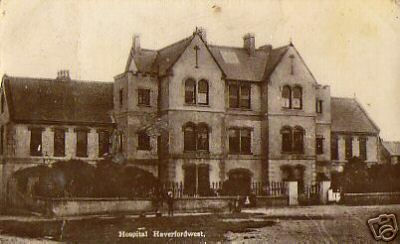 The Haverfordwest Borough Asylum was the first of its kind to be created by a local authority within Wales and was to remain for many years to be the only one. The town of Haverfordwest had become an significant port centuries before and its importance led to it gaining county town status from Pembroke as well as being granted Borough status as a county corporate in 1479. This status was to remain until the local government reforms of 1974 which saw the abolition of both the county and borough. This status allowed the town an amount of autonomy within Pembrokeshire to the extent that by the early 19th Century both Pembrokeshire County and Haverfordwest Borough housed their gaols within the town. Pembrokeshire concentrated their inmates at Haverfordwest Castle, which had been adapted for the purpose from 1779 until a new building could be constructed to replace it in 1820. Haverfordwest housed their own inmates within their own premises on the south side of St. Thomas’ Green, south of the town centre, but by the 1820’s opinion locally was decided that these premises would better serve as a lunatic asylum for the borough and that the Haverfordwest inmates should be concentrated with those at the new gaol at the castle instead. A petition and subsequent Bill were put before parliament in march 1822 and were awarded Royal Assent allowing the building to be re-appropriated. 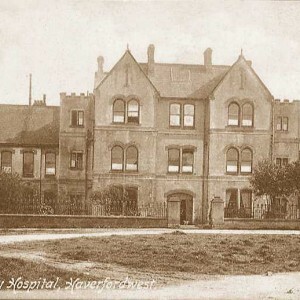 By the time that the asylum opened, around September the same year, Haverfordwest was one of only a handful of authorities in England and Wales combined. Only Nottingham, Bedford, Norwich, Lancaster, Stafford, Wakefield and Bodmin had opened as county asylums at this time and no other boroughs had yet provided accommodation independent from their surrounding counties. Haverfordwest was to remain the solitary borough only asylum until Kingston upon Hull purchased and opened their’ own premises in 1849 followed by Birmingham borough in 1850. Typically welsh authorities had accommodated persons of unsound mind in poorhouses or boarded at one of the few available private licensed houses which existed, such as Mayhill, near Swansea from 1815 or Vernon House in Briton Ferry from 1844. The accommodation available at Haverfordwest asylum appears to have seldom been considered satisfactory for the purpose, a situation which became much more apparent once the Commisioners in Lunacy had been established in the 1840s , their reports typically scathing of the premises and it’s management. The asylum, like those at Norwich, Melton, Hull and others was run as strict an economy as could be possible to limit the cost to the taxpayers of the town. Such budgetary restrictions, along with a confined site were to perpetually limit the scope of the asylums expansion whilst also blocking other improvements. Capacity of the asylum, which was divided by gender, was typically to under 20 patients, rising eventually to around 40, albeit in overcrowding although the capacity held was usually proportionate to the needs of the borough. A pair of airing courts had been provided for limited outdoor recreation, one for each gender. The premises was managed by a husband and wife team, consisting of a keeper and matron, for which the asylum had also received criticism as no resident medical officer had been employed there. By 1847 attempts were being made to form a consortium of local authorities to construct a ‘United Counties Asylum’ for Cardiganshire, Carmarthenshire, Pembrokeshire and Glamorgan, to be sited at the Dan-y-graig estate near Swansea. The involvement in the project as a minority participant would likely have led to the closure of the asylum far earlier than was eventually to be the case. However Glamorgan were to pull out of the agreement in order to construct it’s own asylum at Angleton, near Bridgend, which eventually opened in 1864. The remaining authorities search for a site resumed as the Swansea site was now considered inconveniently located for the counties it would now be required to serve. The second local authority asylum finally opened in 1848 at Denbigh for the North Wales counties, son followed by another at Abergavenny in 1851. Around this time conditions at the Haverfordwest Asylum remained rudimentary and unsanitary despite regular demands by the Comissioners in Lunacy to improve the facilities, which they felt were worse than the Poor Law Union Workhouse. By 1851 a new asylum operated as a private licensed house had opened in Amroth Castle near Saundersfoot and attempted to offer facilities for taking predominantly pauper patients from the surrounding authorities. The role of the new madhouse was to be shortlived however as amidst much concern over it’s management the asylum closed in 1856. Plans were put in place for the United Counties Asylum to be located at Job’s Well near Carmarthen and along with Cardiganshire, Carmarthenshire and Pembrokeshire, Haverfordwest was to become a contributing authority. 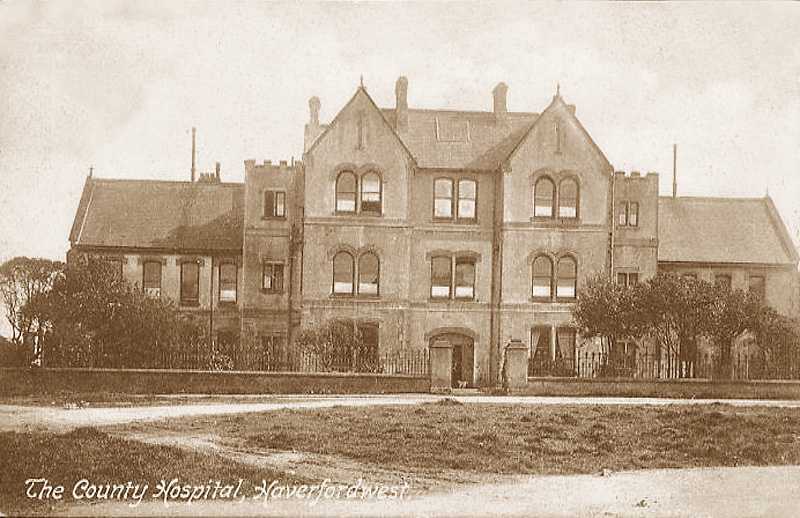 With the opening of the new purpose built asylum in 1866 the old Haverfordwest Asylum was vacated. 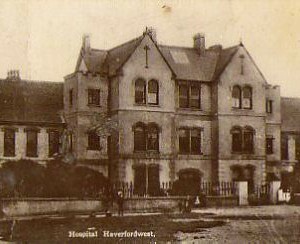 After closure the building appears to have been demolished and by 1872 the new Pembrokeshire and Haverfordwest Infirmary was built. This institution had opened close-by in 1859 but had required better premises. As such the building remained on the asylum site until 2007 having become the County Offices after the Infirmary relocated to Winch Lane in 1923, becoming the Pembroke County War Memorial Hospital. The County Offices relocated in 1993 and were demolished for a new swimming pool and leisure complex, which opened in 2009.